This is a delicious and colorful treat that we know everyone will enjoy. 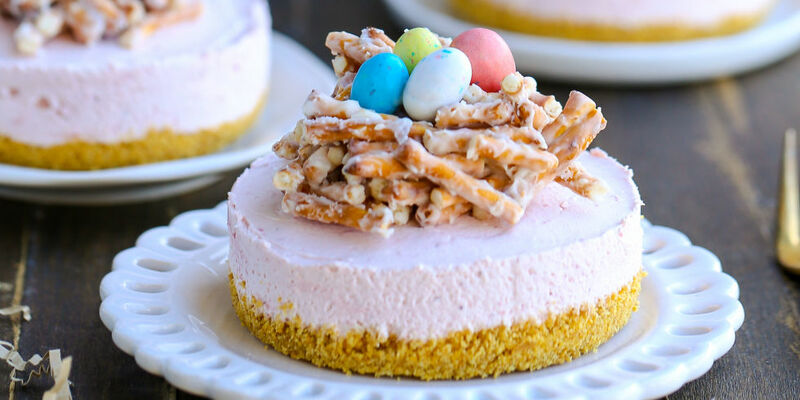 Due to it’s “full of life” colors and flavor, this is a great recipe to have for Easter or as some prefer Resurrection Day. We are featuring it for March, however you could enjoy it anytime. Just change out the pretzels and eggs and come up with your own idea for a top for a total new theme. The recipe and the image are by Rachel Conners. 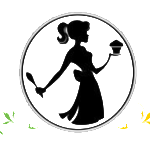 You can find other delightful recipes by Rachel at Delish.com. 1. Lightly grease three mini spring-form pans or line six standard muffin tins with liners. 2. Make crust: In a bowl, combine graham cracker crumbs and melted butter. Press into prepared pans. Set aside. 3. Make cheesecake filling: Pour strawberry puree into a small saucepan and bring to a simmer over medium heat. Let simmer 10 minutes, stirring occasionally, until reduced by half. Remove from heat and let cool completely; you should have about 1/4 cup of reduced puree. 4. In a large bowl, beat melted white chocolate with cream cheese until smooth. Add strawberry puree and powdered sugar and beat until fully incorporated and completely smooth. Add in thawed whipped topping and beat mixture until creamy and fluffy, scraping the sides as needed to ensure everything is fully incorporated. 5. Divide filling evenly between the crusts, evening out the top with a knife or spatula. Refrigerate at least two hours before serving. 6. Make pretzel nests: While cheesecakes are cooling, line a baking sheet or plate with parchment. Place pretzel sticks in a bowl and pour melted candy coating over the pretzels. Use a fork or your fingers to coat pretzels, and then form three larger nests or six smaller nests, depending on how many cheesecakes you have. Let the nests cool and harden on the parchment. 7. Place Robin’s Egg candies in the nest while the chocolate coating is still warm so they stick. Let cool completely, then place on top of the cooled cheesecakes before serving. This Delicious ini No-Bake White Chocolate Strawberry Cheesecakes Recipe was featured by our friends at Delish.com. Delish.com is part of Hearst Digital Media. The Delish.com team has a great publication that is packed with great recipes from talented chefs, bakers and cooks. We invite you to check them out., you won’t be disappointed. The site is engaging and fun plus you will get some really good ideas for any occasion.